The Day Satchel, featuring original hand-printed fabric. This larger cross body purse is the perfect size for the day’s essentials, whether out shopping, off to class or heading to work. 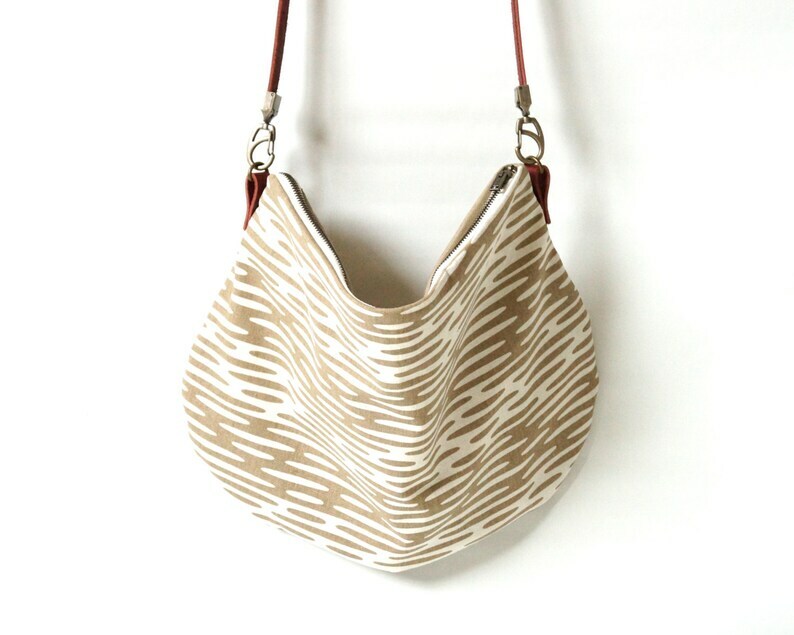 The purse combines an original Cloth+ink print with a sturdy khaki organic canvas. Finished with internal pockets, antique brass zipper and brown leather strap. Also makes a perfect gift for one lucky lady! The flickering sunlight dancing over the ponds is what inspired this original print design titled ‘Ripplets’. The light bounces from positive to negative creating a dazzling pattern. Shown here in a ‘Mushroom’ brown on a natural cream based fabric. Original print and purse design by designer-maker, Helen Peterson. If you require a longer or shorter strap please contact me with the details prior to purchase. Fabrics and Process: Fabrics of the highest quality are sourced from ethical farms using organic, sustainable farming techniques. Fabrics are printed by hand using a silk screen method. - Construction: machine sewn with professionally finished seams, sturdy metal rivets for strap attachment, antique brass zipper and internal pockets. - Care Instructions: gentle machine wash or hand wash, lay flat to dry. If machine washing, remove the leather strap to protect your purse and machine.